Rewinders from Labelmate roll up printed label material into an even roll once it comes out of the printer. They are excellently suited as accessory devices in areas of usage where time is a valuable commodity: printed labels are immediately ready for transport and storage. The rewinders retain a constant torque strength during the entire production process to avoid strain on the printing material. Labelmate offers models for nearly every label width and roll core size for roll diameters up to 400 mm. As needed, the speed may be readjusted. • High winding speed: up to 125 cm/sec. The simple handling of the label rewinders significantly contributes to time savings: simply push the receiving core onto the holder, attach the labels and you are ready to print. Plus, the printers do not require much space yet achieve speeds of up to 125 cm/sec., effortlessly keeping pace with the fastest printers on the market. If labels need to be printed multiple times, choose the combined use of rewinder and unwinder – to make completed label rolls immediately ready for further processing. Labelmate CAT-3-10-INCHES - Labelmate CAT-3-10-INCHES, Industry Standard Heavy-duty label rewinder, core holder: 76 mm, max. roll diameter: 300 mm, max. roll width: 255 mm, speed: 125 cm/sec. Labelmate CAT-3-1-INCH - Labelmate CAT-3-1-INCH, Industry Standard Heavy-duty label rewinder, core holder: 25.4 mm, max. roll diameter: 220 mm, max. roll width: 155 mm, speed: 125 cm/sec. Labelmate CAT-3-ACH - Labelmate CAT-3-STANDARD, Industry Standard Heavy-duty label rewinder, core holder: 25 to 101 mm, max. roll diameter: 280 mm, max. roll width: 155 mm, speed: 125 cm/sec. Labelmate CAT-4-10-INCHES - Labelmate CAT-4-10-INCHES, Heavy-duty label rewinder, core holder: 76 mm, max. roll diameter: 300 mm, max. roll width: 255 mm, speed 125 cm/sec. Labelmate CAT-4-ACH - Labelmate CAT-4-STANDARD, Heavy-duty label rewinder, core holder: 25 to 101 mm, max. roll diameter: 280 mm, max. roll width: 155 mm, speed 125 cm/sec. Labelmate CAT-4-1-INCH - Labelmate CAT-4-1-INCH, Heavy-duty label rewinder, core holder: 25.4 mm, max. roll diameter: 220 mm, max. roll width: 155 mm, speed: 125 cm/sec. Labelmate MC-10+ - Labelmate MC-10+, quality label rewinder, core holder: 76 mm, max. roll diameter: 220 mm, max. roll width: 125 mm, speed 50 cm/sec. Labelmate MC-11+ - Labelmate MC-11+, quality label rewinder, potentiometer, core holder: 25 to 101 mm, max. roll diameter: 220 mm, max. roll width: 125 mm, speed: 50 cm/sec. Labelmate ZCAT-6-R/L - ZCAT-6-R/L, Heavy-duty label rewinder, core holder: 76, max. roll diameter: 300 mm, max. roll width: 170 mm, speed: 125 cm/sec. Labelmate ZCAT-6-L/R - ZCAT-6-L/R, Heavy-duty label rewinder, core holder: 76, max. roll diameter: 300 mm, max. roll width: 170 mm, speed: 125 cm/sec. Labelmate ZCAT-8-R/L - ZCAT-8-R/L, Heavy-duty label rewinder, core holder: 76, max. roll diameter: 300 mm, max. roll width: 220 mm, speed: 125 cm/sec. Labelmate ZCAT-8-L/R - ZCAT-8-L/R, Heavy-duty label rewinder, core holder: 76, max. roll diameter: 300 mm, max. roll width: 220 mm, speed: 125 cm/sec. Labelmate ZCAT-10-R/L - ZCAT-10-R/L, Heavy-duty label rewinder, core holder: 76, max. roll diameter: 300 mm, max. roll width: 255 mm, speed: 125 cm/sec. 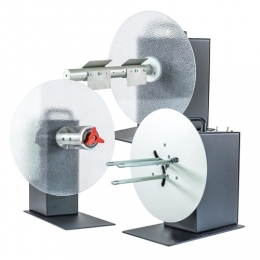 Labelmate ZCAT-10-L/R - ZCAT-10-L/R, Heavy-duty label rewinder, core holder: 76, max. roll diameter: 300 mm, max. roll width: 255 mm, speed: 125 cm/sec.